or more precisely to the Sweet 16 and the sewing machine. There are 18 days until it is quilt drop-off day, I'm more or less on schedule to finish my quilts. The binding is on both the challenge and the miniature quilts, just have to handstitch the back part down which shouldn't take too long. The hanging sleeve is on the hexie quilt, I tried out the tutorial here and it worked well, I can't see any stitches on the front side, I'll definitely do this technique again. The red and white quilt is coming along, most of the blocks have some quilting completed, I'm planning on doing the borders soon, then the binding, and then back to finish off the quilting. This star was really puffy before quilting, and I had no idea how to quilt it and was sitting there pondering when it came to me, it worked out really well, taming the puffiness quite nicely and best of all I only had the starting and ending threads to tie off and bury. This is the centre of another star, I'm still thinking about the rest of the quilting on this one. I should get some inspiration from the AMQF this weekend as there will be plenty of quilts on show there. This is the compass star and I've just quilted the red points so far, still waiting for more inspiration to strike with this one as well. 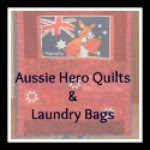 This weekend will be a busy one as I am going along to the Australian Machine Quilting Festival, I'm taking a couple of classes, catching up with friends and possibly investing in a couple of rulers or fabric or thread (maybe all three). It is also daylight saving (clocks forward one hour) and I find it hard to adjust to the change the first couple of weeks, one good thing is that there will be more daylight for quilting. beautiful blocks, amazing quilting, good luck getting it all done in time! looking quite impressive Pip, sounds like a good plan to get finished on time. Wow . . sounds like no time for the garden, the Mister or Cody. Or even Chocolate! Your quilting is so impressive....good luck with the schedule, and enjoy AMQF. Inspired quilting Pip!. Love the red and white stars. Your quilt looks beautiful and so does the quilting, I'm sure you'll get it done on time.